As you have heard, I’m not really a cereal person. For some reason, even though I love to plan the weekly dinner menu, I just don’t like breakfast certainty. I don’t want to look at a huge box or jar of cereal and feel I have to eat it when what I really feel like is a boiled egg, or fruit compote, or porridge, or even just vegemite on toast. But, but…for some reason this toasted muesli is different. I still don’t eat it every day, but I love having the jar there, and knowing I can use it to top a bowl of greek yoghurt and blueberries (my favourite combination) or stewed apple, or even just a handful by itself… It might be because it’s made of just the ‘good bits’ with nothing that could remotely be considered filler, or because it has the perfect balance of sweet and salty and mapley and crunch. I don’t really know, I just know it’s easy and delicious and I love having a jar on the shelf. If you’re a breakfast agnostic too, or just love toasted muesli, give it a try! Preheat oven to 130C. Line one large or two medium baking trays with baking paper. Combine all dry ingredients in a large bowl. Stir together the oil and syrup, and mix through the dry ingredients until they are thoroughly coated. Spread evenly onto your tray(s), aiming for as thin a layer as the trays will manage. You can pile it up, but it will mean a lot more stirring. Bake for 40-50 min, stirring every 10 min to move the browner edges towards the middle and turn the mixture over so it all browns evenly. 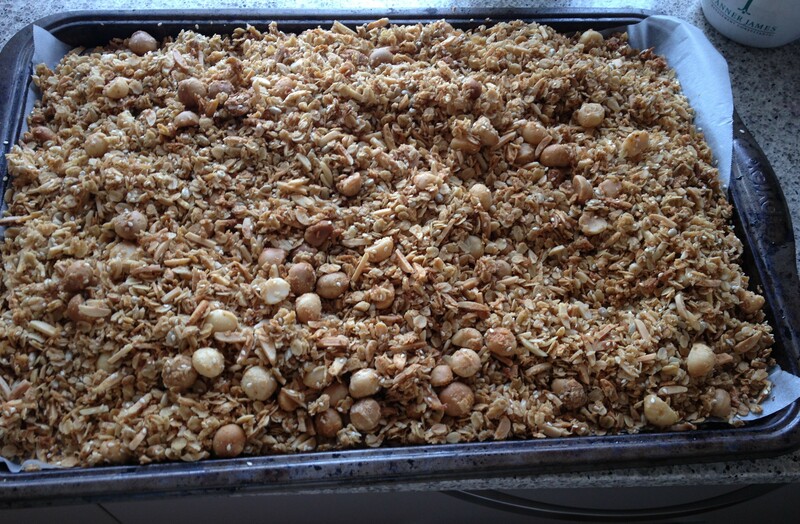 When the muesli is a mostly even golden brown, remove from the oven and allow to cool completely on the tray. Store in a large airtight container or jar for up to two months. Serve with fruit and yoghurt, milk, over ice cream, plain by the handful… Because of the richness of this mixture, when eating for breakfast I tend to reverse the usual proportions and have a bowl of yoghurt/fruit etc with no more than 1/3 cup of the muesli to top. 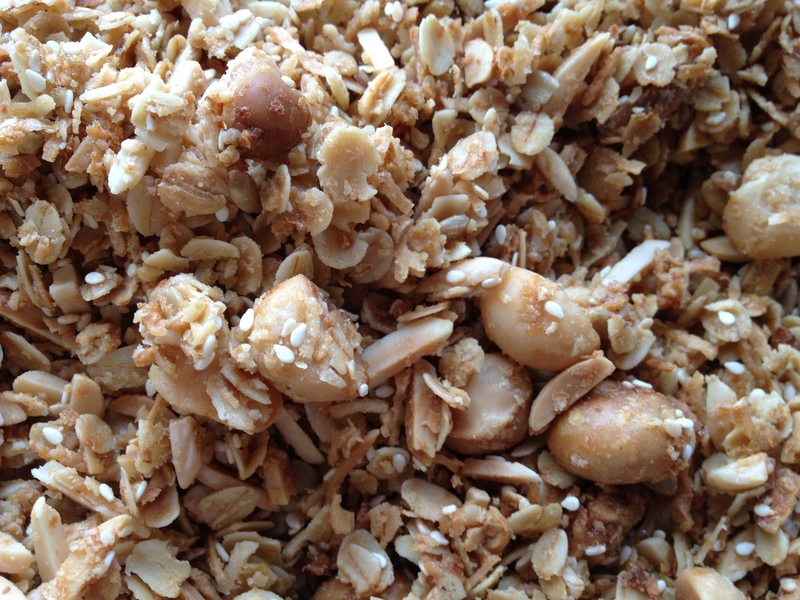 I love making granola – yours looks amazing. Loving the chunks of flavour you’ve got going on. Thanks! Yes it’s pretty fun to make, and lasts for ages so it’s well worth making a big batch.